laborer of the eleventh hour: What is a Leader? 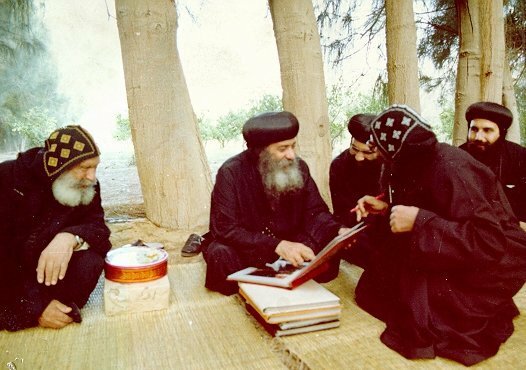 We are all saddened to hear of the departure of our Great Patriarch, Pope Shenouda III. Truly the life of this Holy man will not be forgotten. My friend, Mena Mirhom, gives a great account of when we presented FTFT! to HH in a clergy seminar in Boston - to focus on his evangelistic nature. I would like to focus on the leadership of HH that we all have experienced, and something I would yearn to have one day. This past Saturday I was attending a spiritual day with Fr Athanasius Farag, where the topic was diakonia, the greek word for service/ministry. We focused on a few points, until we had learned of the unfortunate news. What caught my eye was a verse he chose from the gospel according to St Luke. The Church, in her wisdom, also appointed this passage to be read at a funeral service for a Patriarch, Metropolitan, or Bishop. Coincidence? I think not - this goes to show how they truly, particularly HH, lived the true meaning of diakonia - as a leader! "For who is greater, he who sits at the table, or he who serves? Is it not he who sits at the table? Yet I am among you as the One who serves." Luke 22:27 (emphasis, mine). I had to read that a few times. Christ is talking to his disciples here, asking a rhetorical question that the obvious answer seems to be right there. He even answers it for them - but then throws a curveball, "Yet I am among you as the One who serves" - diakonia. A more precise definition would be to serve out of one's own will. Just as Christ says, "I did not come to be served, but to serve", a true leader reflects this characteristic. HH Pope Shenouda III really showed this type of leadership. As Fr Antonios Kaldas, in a guest post on Fr Anthony Messeh's blog, "He had a way of making an unimportant stranger feel important, a way of giving you his attention in a way that said, 'At this moment in time you are more important to me than anything else.'" Always caring for what the people and youth want, choosing clergy to better serve them, building churches, allowing services to go on, blessing ministries. I remember one time walking into a meeting where HH met with roughly 30 youth from a church, to see their needs and opinion - to help choose the best priest. His care for an individual and the future of the church was great. I don't know another man who has affected so many youth in the Coptic Church like I've seen with HH. He wasn't just a figurehead in a far away place, he was caring, involved, responsive, and loving. A wise leader and servant. One quote I read in a book truly defines HH. Ever see him get asked a question or in a conversation? Every word he speaks is chosen carefully, and there is no regret after it is released from his mouth. May the Lord grant to us a good shepherd, like His Holiness Pope Shenouda III, to shepherd His people in purity and righteousness.